Last year we shared about a new book for children from Seattle-based artist Hannah Viano, S is for Salmon: A Pacific Northwest Alphabet . Viano’s beautiful paper-cut art combined with learning about Pacific Northwest natural history made for a handsome little book about the ABCs. Her new book likewise combines colorful and both sharp and flowing images with aspects of Pacific Northwest life. 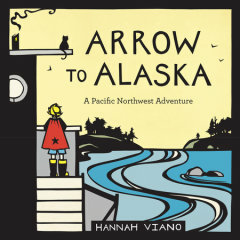 Hannah Viano, Arrow to Alaska: A Pacific Northwest Adventure (Seattle: Sasquatch Books, 2015), 32 pp. This entry was posted in books, portland children's museum. Bookmark the permalink.